Let me start by saying that overall the movement from separate GST and provincial sales taxes to a harmonized sales tax is a good idea. The application of HST to certain financial services is not. The current provincial sales tax systems have elements of double taxation. Many business purchase goods and pay the retail provincial sales tax on those purchases. In many cases the provincial sales tax paid by the business is an expense to that business. The additional expense is passed along to the end consumer through higher prices. When the consumer pays for the product, they pay the provincial retail sales tax on the entire amount of the purchase, including the “input” costs paid by the business. The GST (and HST) requires the business to charge the full amount of the sales tax to the buyer buy also allows the business to claim the sales tax paid back. The cost of operating then goes down and over time the underlying prices will fall. The price change is probably not immediate, but rather prices will not increase as fast over time. Mutual fund management fees and certain account fees are subject to GST and HST. The financial institution does not have access to the credits available to other businesses and the application of the HST represents a cost to the business that is passed to the consumer. With mutual funds, HST lowers the rate of return. 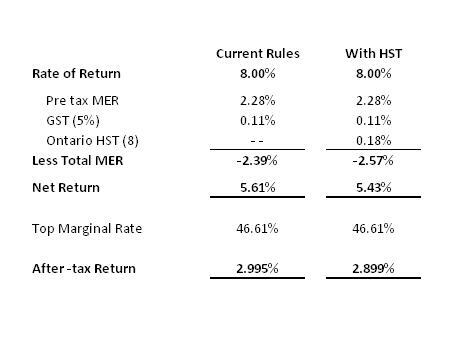 With the imposition of the HST (and the GST), the overall rate of return is lowered. An 8% return is high and on an after-tax return basis anything less will not beat inflation. A couple of ideas may be floated to address the tax on savings. Fully exempt all financial services. The end consumer benefits from higher rates of return and the government can re-coup the lost sales tax revenue through the income tax system. Exempt mutual funds in retirement accounts from GST and HST. Ultimately, the rate of return of the investments will go up and the government can re-coup this when the investor withdraws the funds as a RRIF payment. This will also reduce the strain on OAS by increasing an individual’s taxable income. Should the existing financial services continue to be subject to GST and soon the HST? Share your thoughts by leaving a comment. What If GST Was Not Charged On Mutual Fund MERs?